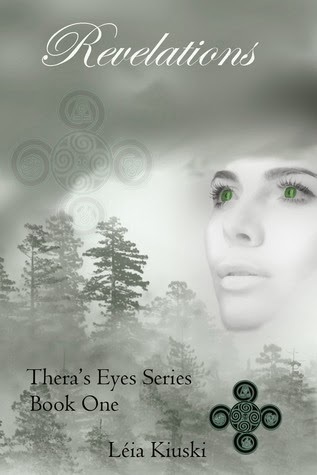 Revelations sets the foundation for the Thera’s Eyes series. It follows a group of young people who are given special gifts. They are considered “Warriors” and are the only ones that are able to fight the demons that threaten to destroy their town of Silver Blade. The main character, Beth, was specially chosen by Thera (a goddess) herself to be the leader, but she is also the main target of the demons threatening them and the town. Her friends are her guardians and their job is to help fight the demons and make sure that Beth is safe and stays alive in order to carry out the necessary tasks. The book begins with Beth struggling to accept her current life situations. Her parents recently died in a freak plane crash (which is later explained in the book). Her twin brother was also on the plane but mysteriously had no physical damage. He was in a coma though, and the doctors could not figure out why or when he would come out of it. Beth constantly wakes up screaming from what the doctors tell her are “night terrors” although she doesn’t quite believe those are exactly what she is experiencing. When a stranger named Leon comes into town and rents out Beth’s guest house, everything is set into motion. The warrior in her and her friends is awakened, and their abilities are used to fight the demons. There is one main quest, they must find and close the portal before noon on Halloween day, or else the demons will have complete access to their world. This includes the strongest demons that they have not yet had to come in contact with. They must accomplish this all while trying to protect the town and the people in it. Did I mention Beth and all of her friends are still in school? They miss basically every day of school, but because her parents are dead, and the parents of the other warriors are out of the country, no one can be contacted and made aware of the problem. I didn’t think I would find myself connecting with these characters and getting as invested in them as I did. By the end I was really rooting for them, and rooting for the budding romance that takes shape as well. The ending leaves much to be imagined, but I would assume that is because this is only book one in a series, and the answers will be revealed in the upcoming books. The writing was pretty smooth. I felt that it had a pretty good flow, and despite coming in at about 200 pages (PDF version so I don’t know what the published versions will be), it was a pretty quick read. The chapters were kept relatively short so it didn’t seem as though it was dragging on. My one complaint is that it does need some more editing before being called a finished product. There were time were I found the incorrect word being used (have instead of has), and that was pretty consistent throughout the book. Otherwise, the writing overall was pretty good. It kept my attention which isn’t always an easy thing to do with sci-fi type books.